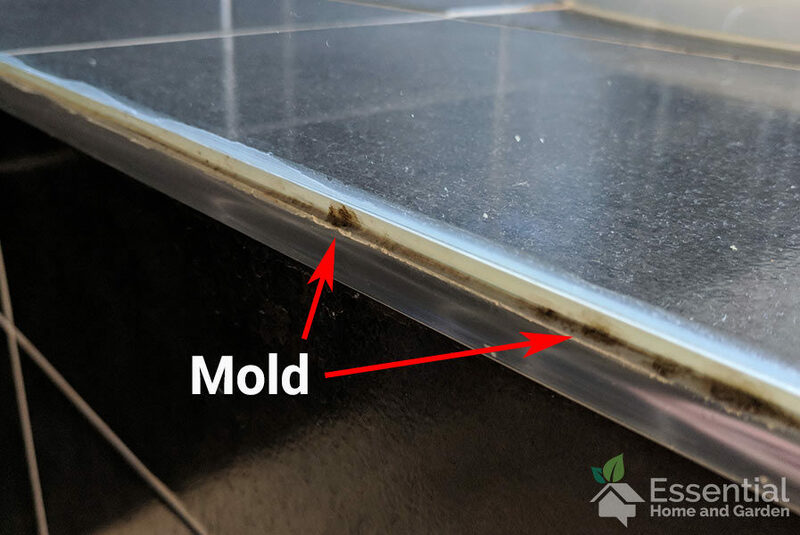 No matter how often you clean your shower, it is likely that at some point (especially during the colder months) you have noticed some mold growing. And once it start’s growing, it doesn’t take long before it seems to be in every crack and crevice! If you find yourself in this situation, then there is no need to stress. There are some relatively easy ways to remove mold from your shower area. Removing most mold from the shower recess is actually pretty easy. 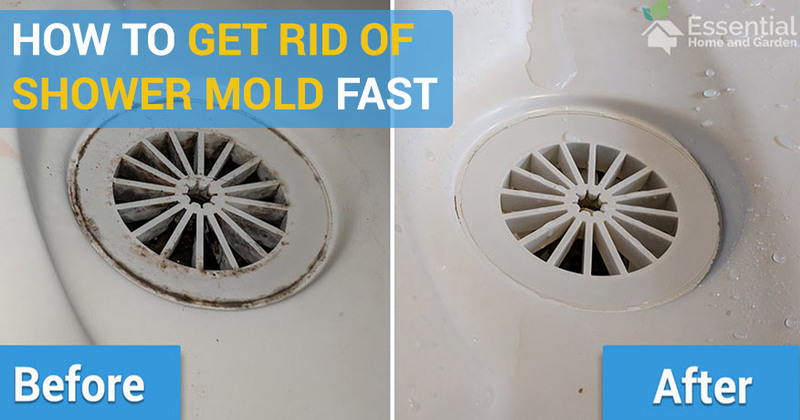 The drain hole/plug hole one of the most common spots for mold to grow, take a look at the pic below for a before and after pic. See what I mean? Full of mold….but how did we get rid of it? Thankfully – the steps are pretty simple. For more info on safety when using bleach, see this page. Rinse off the dirty water/bleach and there you have it nice and clean! 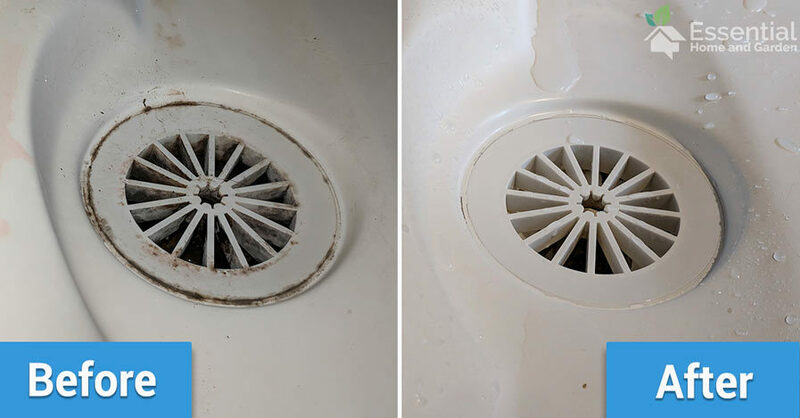 Are your bathroom floors dirty? See our best steam mop article for an easy way to keep them clean. 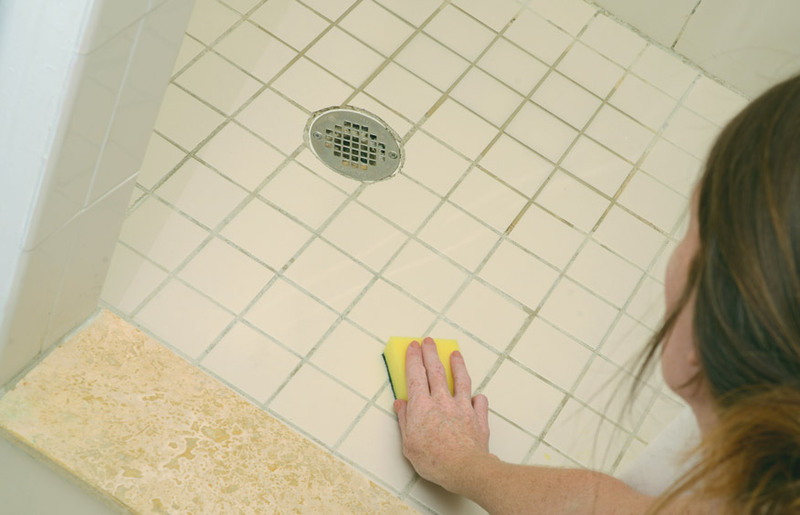 Shower grout is particularly susceptible to mold due to the fact that it is porous and holds water for longer. For this reason, you will often see mold growth in grout before anywhere else. The procedure to get rid of this pesky mold on shower walls is very similar to the method I mentioned above. If your grout is colored, then steer clear of bleach as it can cause the color to fade and go for one of the alternative solutions for cleaning mold at the end of this article. Mold on shower caulk can be a little more difficult to remove sometimes, so the procedure is slightly different. Bleach is great for removing mold, but to be honest – it isn’t the greatest stuff to expose yourself too. So for those of you that prefer more natural options for removing mold then you can try substituting bleach for any of the following. White Vinegar: Vinegar is a great natural cleaner and is known to kill most varieties of mold. It can be applied as straight vinegar or diluted slightly if the smell is too strong for you. Baking Soda: Mix baking soda with small amounts of water to form a paste and let it sit on the mold affected area for 10 – 20 minutes. Then use a bit of elbow grease and a nylon brush to scrub that mold out of existence! If you want to make a stronger paste, then use vinegar instead of water – just don’t use too much vinegar as this is also the method to make the famous model volcano. Shower curtains made from plastic or PEVA often stay damp for long periods of time and thus, are mold loves to grow there. If you find that you still have some mold on your shower curtain, then you can try again. Because the curtain is made of plastic and blocks water, it may simply have been because the solution did not really get onto all parts of the curtain. If you have tried this method a couple of times (or if you just want to use the strongest method the first time), then move onto the bleach method. Read our guide on non-toxic shower curtains. Fill the rest of the bucket with water – but do NOT add it to the washing machine yet. You may need to do this twice to make sure the curtain is fully clean. If you still find you have some mold left – then you may need to lay the curtain out on a large flat surface and scrub it off. It’s not just to stop the crinkling: the towels will act as scrubby sponges on the curtain, cleaning it off with zero elbow grease on your part! Great tips, btw, thanks for sharing! Thanks for the tip Jo! I have added the info to the main body of the article.